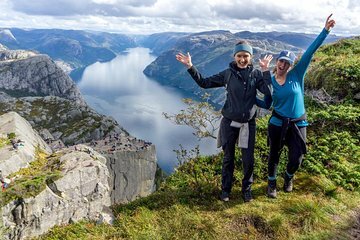 Get off the beaten path in Preikestolen on this hiking and canoeing tour from Stavanger. Navigating this unfamiliar deep forest terrain by yourself may not be the best idea, but with a guide in the lead you'll be safe and get expert navigation. Enjoy epic views and photo ops of Lysefjord and Preikestolen after paddling across the Refsvatn Lake in a canoe. This tour allows you to get much deeper into the wilderness and follows scenic off-the-map trails.